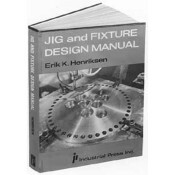 Written for the experienced engineer as well as the student, this comprehensive reference presents the fundamental aspects of jig and fixture design in a readable manner. • Presents the fundamental principles for combining the components into successful fixtures. • Includes metric conversion tables and appendices on transfer of tolerances, measuring of tolerances, measuring of angles in radians, and the dimensioning of fixtures by stress analysis.